Alexander McQueen hobo bag (last seen here). I have to say, I think i'm finally getting used to Fall. The weather in New York has been gorgeous as of late, with bright & sunny days followed by slightly crisper nights. I'm starting to learn to bring a sweater out with me, and finally getting used to incorporating the other half of my closet that's been left dormant during the past five months. Feeling a little bored with my usual hairdo, I also made Micol add these braids into my hair to give my style a little kick. I love the resulting look! Just wish I could learn to do it on myself... but hey, isn't that what friends are for? You look great!! I love the two braids, very cute! Beautiful dress and beautiful you! You look great, love the smoking slippers. Love your look and your hairstyle is amazing... but you do have beautiful long hair! Your area is so cool. I can't wait to return. That dress is ABSOLUTELY STUNNING. Whoa. SO beautiful. 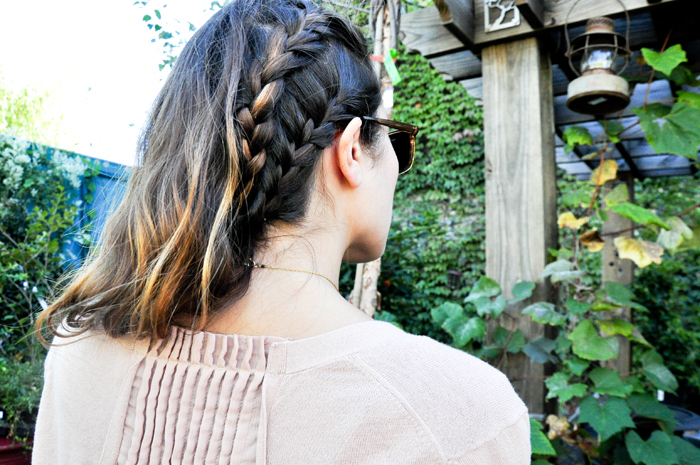 Love the braids – wish I could learn to do that to myself too. Great dress! Such a cute location! Loving those slippers! Soo fab! Perfect photo shoot location for this look! I wish I could create braids this fab! I adore the loafers! Amazing! I love this whole look! especially the braids! Beautiful photos, and I love how the roofs are made used of in NY for parties, gardens etc. great braids! thank you so much for visiting our blog and the lovely comment!hope to see you again soon! ps.let us know if you want to follow each other...! Love the dress is perfect for you!! You have a nice blog & pictures. Wonderful blog! Of course I wanna follow each other! Followed you with pleasure <3 Let's stay keep in touch! I love your blog! I also really like the color of that dress so beautiful. I am now following you. I love the dress and your hair. You look absolutely gorgeous! Oh my gosh such a gorgeous dress - Love your shoes as well! Amazing braid and dress, the color is fantastic and the composition of the photos is incredible! what a a lovely dress!! Following you back now! thank you! Awesome pictures Micol and Ilove that hairstyle on you Lauren, very rocker yet still sweet. Tahnk you both for follwoing and for your sweet comments on my blog. Following you back! Great pictures! Love your style! Following you, follow back if you like my style! I love everything about this look, Micol! From hair to slippers! hehe! I invite you to visit mine, and if you like it, I'd really appreciate if you to follow me back , hopefully via bloglovin! love the tulip dress,so pretty! Btw: great hair. Love the two braids! Thank you so much for stopping by my blog. I'm following you on GFCand Bloglovin! You always look very beautiful and this color works beautiful on you. Your outfit is stunning!! I'm seriously coveting that dress! What a pretty little escape from the city! I love the colors of your clothes against all the greenery. I wish it was sweater weather here in LA...I'm so ready! Beautiful pink dress. Do you like to follow each other on GFC and bloglovin? Let me know will love to follow back. So pretty! I'm following you - I simply love your posts! OMG! Your blog is absolutely fabulous! We are so happy that bloggers like you followed us. We are following u back here, on Bloglovin and Facebook. If you could follow us on facebook as well it would mean a world to us! We are looking to keep in touch through comments. Cant wait for your next great posts. Have to say: perfect photographer, perfect model! I love your braid, you look so sophisticated! Love the look! thank you for following me! love those loafers! <3 following you! I love your dress <3! I'm now following you on GFC and on bloglovin! Love your dress+chic flats and the 2 braids are so cute!! Gorgeous dress, love the tulip silhouette and the colour! Love the cardi and shoes too! 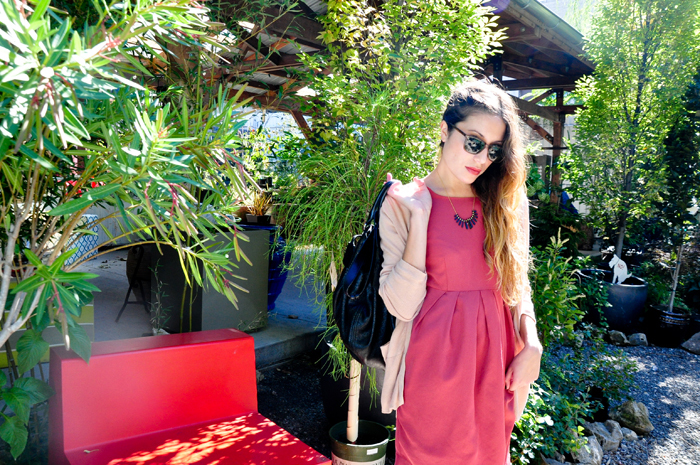 I really love your style and featured your look on my Bloggers Got Style Post! Thanks for the stylish inspiration!